Multimodal analgesia is combined with simple analgesics for treatment. Aloe vera gel is an effective remedy for minor burns and burns pain. Applying honey eases pain and promotes healing. Most burns are accidental and can be prevented. Pain treatment for burns can be difficult as burns vary in type and severity. Burns cause pain due to injury of nerve endings and specialized receptors in the skin. Pain can occur immediately after burns, can be related to procedures such as dressing change or can develop into chronic pain. All types of burns such as from dry heat (such as fire), wet heat (such as steam or hot liquids), radiation, friction, heated objects, the sun, electricity, or chemicals are painful. The severity of pain is not related to the severity of the burn as the most serious burns (third degree burns) can be painless. 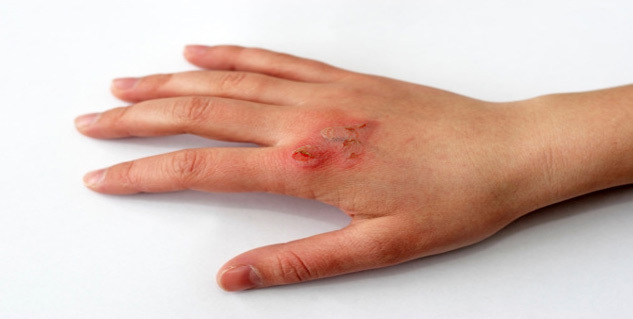 Symptoms of burns other than pain include reddening of the epidermis, swelling and blistering. Burns can be diagnosed clinically but it can be hard to tell the difference between degrees of burn. Tests in burns are usually done to rule out complications such as dehydration, infection, or disturbance of electrolytes such as sodium, potassium. Treatment of pain in burns can be difficult as it can cause intense and prolonged types of pain. Besides the pain due to burns, there is pain during treatment of burns as the wounds must be cleansed and the dressings changed. Management of burn pain can often be inadequate requiring more pain medications. Aggressive treatment for pain is required in burns. Severe pain is anticipated in patients with extensive burns and treated with multimodal analgesia combining, simple analgesics (such as paracetamol, non-steroidal anti-inflammatory drugs [NSAIDs]), and local anesthesia and opioids. Opioids (codeine, morphine) are the main stay of treatment of pain in burns. They are potent, effective, easy to administer but can cause several unwanted side-effects, tolerance, and dependence. The pain relief from opioids is titrated to effect. Opioids or ketamine are used for pain relief during dressing changes. OTC pain reliefs: Simple analgesics like paracetamol, aspirin, and ibuprofen can relieve minor pain in burns. Herbal remedy: Aloe vera gel is an effective and popular herbal remedy used for minor burns and burns pain, caused by heat, sunburns, scalds or just about any kind of skin irritation. Homeopathy: Urtica urens , Causticum, Hypericum perforatum and Cantharis are some homeopathic remedies that will relieve burn pain. Cantharis can relieve burn pain within minutes, with 2-3 pellets under the tongue. The dose may be repeated as needed for pain. Pain due to burns can be relieved with alternate therapies in combination with proper medical treatment; such alternate therapies include massage therapy, hypnosis and acupuncture. Pour cold water or tap water immediately on the burn. This helps the tissue to contract and removes the heat from the tissue. This eases the pain, but does not promote healing. Apply honey to the burns area. It eases pain and promotes healing as well. Aloe vera is also a popular home remedy used for minor burns and burns pain. Most burns are accidental and can be prevented. Devices such as smoke alarms, temperature control of water heaters at home, fire and smoke resistance inherent in building construction can help to prevent burns.